Thanks D for the nomination, you are one of my very favorites. I think if we met on the bus and not on the internet we would still be great friends and we would laugh at everyone else on the bus. 1. Skiing vacation or beach vacation? Which is your idea of how to spend a relaxing day? Beach definitely! I want to lay around and soak up the sun. I get enough snow where I live. 3. Do you have any pets? If so, what kinds? Two dogs and two cats. Love! 4. Do you have any siblings? If so, how many? Are you close to them? I have an older sister and a younger brother and sister. I am close to all of them in my heart but we are all far geographically. Thank goodness for texting. 5. iPhone, BlackBerry, Droid, or other cell phone? iPhone. But I should really branch out. 6. What is your favorite type of cuisine (i.e. Italian, Chinese, etc.)? Italian! Love me some pasta! 7. What is the biggest part of your life that IF or PL has affected? I guess probably my body image. 8. Do you have a lot of good friends or a few great friends? I have a few great friends. 9. If you could meet one famous person (dead or alive) who would it be and why? that’s tough. Obama would be cool. He seems down to earth. 10. What is your favorite Halloween candy? chocolate! 11. If you could have one wish (except for more wishes, haha) what would it be? to have my baby here and healthy right now. Here are some other favorites of mine that you should check out if you do not follow them already. 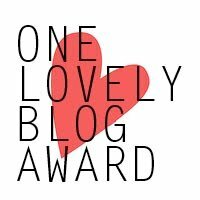 I nominate, for this lovely award….. Here are my 11 questions for all of you beautiful readers. Pick one or two and answer them in the comments or answer them all. 1. Do you cry at movies? 2. Do you prefer card games or board games? 3. What are you most looking forward to in the next year? 4. What do you like to do with time to yourself? 5. If you could run for public office, would you? Why or why not? 6. What fellow blogger would you like to see run for president in 2016? 7. What would you do if you were a man for a week? 8. Do you like to be tickled? 9. If you could change the official spelling of one word what word and how would you spell it? 10. Who is your favorite super hero? 11. Which is the one romance depicted in the movies that you would want to experience in your life? Can I just say one thing? You gals are the dreamiest. Once and a while I check the stats of my blog and one thing that always strikes me is that I had the most views the day that I announced that I was loosing my baby. That was finally surpassed on Saturday when I announced that I was pregnant again. How incredibly awesome are you? Super duper big time 3 scoop ice cream awesome. Thank you all so much for being there for me in the times when I really needed you and thanks for not going anywhere when I finally have something to be excited about. In honor of you and your greatness I have a request. Quietly Southern recently asked for her readers address’s so that she could send a little happy mail their way. And I would like to do the same. If you email me your address at rxy heart at gmail no spaces no punctuation. I will surprise you with a little something on your doorstep or in your mail box. Please please do it. Please don’t feel weird about it. I won’t hunt you down and do creepy things to you (except maybe you Jenny at Stupid Stork since I know you’d like it). And don’t feel weird about getting something fun in the mail! Thank you all for your support and your genuine excitement for me. Ladies. Whatever you are doing right now, please stop and take a moment to acknowledge how completely amazing you really are. Seriously. I never expected to find such amazingly caring and supoortive people. YOU ARE INCREDIBLE. You all get human of the year award. This is all to say thank you for your comments on my post yesterday. As they were rolling in I could feel my strength building. Between you and my animals and my super sweet husband I was able to pull myself off the floor and dry my eyes long enough to seek out carbs and dairy. All of these things are helping. To be honest, I am still a blob of sad. But I am no longer a blob of hopelessness. You all helped me to see that it isn’t over and that I can keep going. You have so lovingly reminded me that I am not alone and I am not out of options. Thanks friends. Celebrate yourself today. When I am feeling crappy about something in my life, I like to take a little extra time picking out my clothes, style my hair, and throw on a little makeup. I think the extra time taking care of my self boosts my mood and looking good definitely helps me to feel good. I had to do that this morning. I have on some of my favorite pants and a new shirt. I took the extra time to blow dry my hair and put on a little makeup. I did all this depiste wednesday being my early day (I teach a 6:30-7:30am yoga class on Wednesdays). I look pretty good, and I feel a little better. Look I even gave the blog a face lift! Maybe that will be enough to boost me back into loving the life I already have. Let me first give props to the amazing Fran at small bird studios for creating my sweet new header. She was great to work with and put up with my endless nick-pickyness. In the beginning I had no idea what I wanted and by the end I got exactly what I wanted. I hope some of you will consider working with her if you want to jazz up your blog face! The header was a prize for participating in the lovely Ms. Breeze’s blog hop. Thank you Dandelion!! I am not sure what to use for the background so I will use these little circles for now, but I may play with it and see what I like. And now I will get into why I feel so crappy, and why I don’t think the makeup will be enough to get me through this day without crying or biting someone’s head off. My ovaries and I had a fight. I don’t know what it was about or when it happened but I do know for sure that they are mad and giving me the silent treatment. I still have not ovulated. It’s day 19 or 20, I don’t even know anymore. I have not had any EWCM and my temps are all over the board. It was just above my normal coverline yesterday and now it is back under. My ovaries have been hurting since Friday, I usually get a little twinge of pain around ovulation so I was hopeful over the weekend. But now it’s been six days of this pain and no spike in temperature. BBT has been 100% reliable for me in showing if I ovulated or not so I think I am just screwed. I don’t know if I am building up cysts in there or what. I am at a loss, I don’t know what the heck to do. I think I might call my previous acupuncture practitioner, I know she is back in town and hopefully she is seeing patients again. The new guy is ok but she and I had it dialed when I worked with her last year. She got where with a certain combination of herbs and needles she could basically produce an egg right there on the table! Ok, it wasn’t that good, but we did have a pretty narrowed down regimen after months of trial and error. I was regular and happy and I did get pregnant. I’m sure this new guy could do the same thing but I don’t want months of trial and error. I only started seeing him because needle lady left town for a few months. I think about breaking up with him but then I start to worry that the success last time was just a fluke. And in all honesty I have been a little lazy in taking my supplements and I have snuck a little bit of sugar in pretty much every day. Part of me wonders if it really is the stress of trying. When we were not trying and using condoms I was also lazy about my supplements and ate sugar like breathing and I ovulated on time every month plus or minus a few days. But now! Now that I am trying again the eggs are refusing to come out and play. What ever I did ovaries I’m sorry!! I really really am. Look I made your blog pretty, can I have an egg now, pretty please? Whew, what a week. Part of me feels like I have been in the car for 8 days straight. I will give an update on our sweet dogie Bear and then try to give the run down of what I have been doing for the last week. But first I want to thank all of you for your kind messages of support for Bear and our family. I missed reading your stories and will do my best to get caught up over the next 2 or three days. Thanks for your patience in my absence. It turns out that Bear did not have a herniated disc. In fact they scanned that dog from nose to tail and did not find any physical abnormality, spinal issues, or tumors anywhere. It took two days but they finally diagnosed him with myasthenia gravis (MG). This is an autoimmune disease that attacks the nerological system of the body and prevents the messages from getting to the muscles from the nerves. So even though he had no pain and was trying to stand and walk his hind legs just weren’t getting the message. Essentially his immune system was killing off the neurotransmitters that send the message. To finally diagnose this disease they gave him a fast acting medicine and within seconds he was able to stand up and walk around. The bad news about this fast acting drug is that it also leaves the system quickly so he was back down after 15 seconds of walking around. To manage the disease we have to give him a slow acting version of the drug which is essentially liquid neurotransmitters, it has to be given at exactly 8 hour increments which has proven to be a scheduling nightmare so far. He also has to be on steroids to suppress his immune system just enough to keep it from attacking himself. There is a slight chance the disease will go into remission in 6-8 months and he can live drug free at that time. That would be great because right now and until that time (possibly forever) we have to be at home at 4:30am 12:30pm and 8:30 pm every single day to administer his meds. The worst part of it all is that the disease has caused his esophagus to enlarge to the point that we have to worry about him being able to swallow. Most dogs with MG end up dying not from the disease itself but from choking or of aspiration pneumonia if their food or water get into the lungs instead of the stomach. So that is the major thing to watch with him. He has to eat and drink in a sitting position and sit there for 10 min afterwards to make sure everything gets to his stomach. This means we have to feed him and give him water to make sure he can sit the whole time. It is so hard to leave him without water all day. He did get a slight case of pneumonia while he was at the vet that is why they kept him for a whole week to monitor him. He is doing better now and we were able to bring him the 8 hours home last night. We got through the night and his medicine and meals and so far he is doing great. I know this is a lot more that most would go through for a dog but he is our child and we would do anything within our means to take care of him. Right now he is able to walk around a little bit and go to the bathroom by himself. He has light in his eyes and plenty of wag in his tail. If he gets to the point that he looses his spirit we will have to make the difficult choice to ease his suffering and put him down. But for now he is our spoiled, high maintenance, old man and we are so happy to have him with us. The majority of the trip was spent in the car driving back and forth from my mom’s house and the vet which are an hour apart. But I did get to go visit my grandpa who is turning 90 this year. And I also was in my cousin’s wedding. She is my younger cousin and we are more like sisters. It was so beautiful and so much fun to celebrate with her. One thing that hit us hard about our baby’s diagnosis is that we were completely in the dark. We knew what downs syndrome was but we didn’t know it was a trisomy or even what that was. We were prepared to deal with anything, to raise our child as long as we could raise a child that wouldn’t have to endure insurmountable suffering. I really thought that if I made it to the second trimester without miscarrying that we would be ok and could handle anything else that happened. Now that I have had a pregnancy diagnosed and terminated for tri 18 I have looked back and gone through the gamut of what ifs. First, I was mad that the midwife didn’t tell me more about the test or the possible outcome. Then, I was mad at myself for not looking into the test and learning more before I turned it down. But now I have come full circle and I still think the test results wouldn’t have been enough to end my pregnancy. Because I didn’t know what I know now, and what I know now is that I went as far as I could. A test telling me that I had a 1:5 chance wouldn’t have been enough, an amnio telling me for sure my baby had it wouldn’t have been enough. I would have always wondered if somehow my baby was going to beat the odds. It took an ultrasound and a confirmed list of problems my baby was already facing for me to make that impossibly tough call. Partly this is just the person I am. But part of it I think is that I had no idea. I had no idea what trisomy 18 was or what it meant or that it even existed. I had never heard of this terrible possibility. We don’t talk about these kinds of things. Even as common as miscarriage is, women don’t talk about it. And I think it should be talked about. I don’t think every pregnant woman should have to take a detailed, nightmare inducing class on all the things that can go wrong with a pregnancy. But I think there should be some awareness, an honest look at what the reality is. Just as I advocate for people to learn about their bodies and the many ways infertility can affect couples, I want to advocate for potential parents to be informed, to know what is out there. So when they are asked if they want a particular screening or test they can reply with a yes or a no and have the confidence to feel good about their choice and not have to rely on what the stinky midwife says. I was inspired to write this post because I was intrigued by the badge on Elizabeth’s blog. When I clicked on it I was taken into a whole world of people that also want to get this message out. Thanks Elizabeth! I am the face of loss. I love Blogs. I really do. I love finding new ones and reading them from the beginning, I get so wrapped up in them. It’s like reality TV without the moving pictures. But also they are such a great way to get ideas, and to share lives and to build community. When I was getting married I loved wedding inspiration blogs of course. I even had a hard time letting them go once the wedding was over. I could have planned 2 or 3 more weddings for us with all the amazing ideas out there. Ooh cooking blogs are fun too, especially vegetarian ones where I can get new ideas. I’ve been known to lurk around a sugar free cooking blog or two when I try to live life without my sweet sweet friend. Last night as I was looking at bathroom inspiration for our impending bathroom remodel and I was thinking, how come i have a sad doom and gloom IF blog and not a fun colorful home projects blog? But then I looked at some of the comments and even though they were nice and friendly they were mostly just “ooh that’s pretty thanks for the idea.” And to be honest, I am focused on making a baby right now and the house is kind of on the back burner. So, infertility blogs and loss blogs are the ones that have my heart and most of my time right now. Even though there is a part of me that would much rather be an unstoppable creative carpenter or paper flower maker or something the IF blog community cannot be beat. I can’t say that I am happy I have pcos or that I lost a baby but nothing can change those things and blogging does change how I feel about them. Having you all out there sharing your stories and good and bad days with me really helps too. The love and compassion that you all convey though comments is just about as good as chocolate chip cookies. It’s sappy, but, I love you guys. Pretty soon when we all have babies in our arms were are going to have to start some of those other kinds of blogs.